The chemical transformation of ammonium cyanate into urea has been of interest to many generations of scientists, since its discovery by Friedrich Wöhler in 1828. Although widely studied both experimentally and theoretically, several mechanistic aspects of this reaction remain to be understood. Knowledge of fundamental physico-chemical properties of solid ammonium cyanate is a prerequisite for understanding this solid-state chemical transformation. In this issue, two fundamental axes has been investigated as described below. Dynamic properties [ref 35]. A comprehensive study of the dynamic properties of the ammonium cation in this material has been performed by means of incoherent quasielastic neutron scattering (QENS) and solid-state 2H NMR spectroscopy. These techniques provide insights into dynamic properties across a complementary range of time scales. The QENS investigations (carried out on a sample with natural isotopic abundances) employed two different spectrometers, allowing different experimental resolutions to be probed. The deuterium NMR experiments (carried out on the deuterated material ND4+.OCN-) involved both NMR line shape analysis and NMR spin-lattice relaxation time measurements. 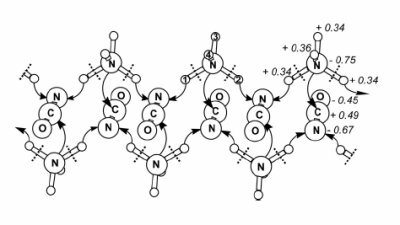 The results of both the QENS and NMR studies demonstrate that the ammonium cation exhibits reorientational dynamics across a wide temperature range, and several dynamic models (based on knowledge of the crystal structure of ammonium cyanate) were considered in this work. It is found that a tetrahedral jump model for the dynamics of the ammonium cation provides the best description for both the QENS and NMR data, and there is excellent agreement between the values of activation parameters established from these two experimental approaches, with estimated activation energies of 22.6 kJ/mol from QENS and 21.9 kJ/mol from NMR spin-lattice relaxation time measurements. The wider implications of the results from this work are discussed in ref 35.